Arunachal Police Housing & Welfare Corporation Ltd.
Over the years, it was felt very necessary for the Arunachal Pradesh Police to have its own construction agency to construct residential and non-residential buildings for the department funded under Annual Operation Plan by the State government, Modernization of Police force by MHA, Border Area Development Programme and others , as the department has been facing acute accommodation problem and agencies or departments to which the funds were placed, could not render satisfactory service owing to various reasons. Many projects were lying uncompleted for many years. 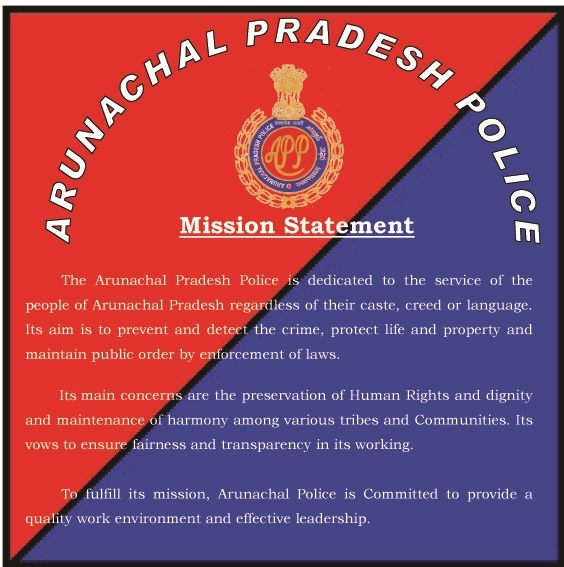 It was with this background that the then Director General of Police, Arunachal Pradesh, Shri Amod K. Kanth, IPS, coined the idea of establishing Arunachal Pradesh Police Housing and Welfare Corporation and vigorously pursued with the Govt. actively assisted by the then IGP, Shri DharmendraKumar, IPS and the then DIGP(HQ), Dr. N. Dilip Kumar,IPS. On getting approval from the State Govt., Dr. N. DilipKumar, IPS took up the job of making correspondence with Registrar of Companies and also drafted the Memorandum of Association and Article of Association for the Corporation. The Corporation was finally registered under Companies Act, 1956 vide No.23- 07947/2005-06 dated 9th November, 2005. The Corporation has an authorized share capital of Rs.5,00,00,000.00 (Rupees five crores) only and divided into 5 lakh equity shares of Rs.100/- (Rupees one hundred )only. However, it has paid up share capital of Rs.2,10,000/- (Rupees two lakhs ten thousand ) only. All the shares of the Corporation are held by the State Govt. through Commissioner(Home), DGP, IGP, DIGP(E), DIGP(W), DIGP(HQ), 7 (seven) designated officers and Finance & Accounts Officer. The number of shares of each officer is 300. The Corporation came into being in November 2005, but it could not start construction work for the department due to various reasons. One of the main reasons was non-availability of Manual. The Corporation adopted the CPWD Manual in its 6th meeting of the Board of Directors held on 24/1/07. After adoption of Works Manual only, the construction works were started w.e.f. February, 2007. Since then the Corporation has been successfully constructing the building of the Police Department maintaining quality construction as per the specification.